June 30, 2007, 1 p.m.
Rollins, ss; Bourn, lf; Utley, 2b; Howard, 1b; Rowand, cf; Victorino, rf; Dobbs, 3b; Ruiz, c; Happ, p.
Doubleheaders are fun when you are on the winning end both times. Splitting is OK. Losing both stinks. So Friday was a stink day if you are a Phillies fan. It was the ninth doubleheader in Citizens Bank Park history and the first time the pinstripe players lost both. The good thing about baseball is there’s another day, another game right away. Don’t have to agonize over a loss for a week. Jimmy Rollins will wear a wireless microphone during this afternoon’s game for FOX. Michael Bourn will announce the Phillies lineup. Annual team Phillies team photo was taken at 2 this afternoon. All fans will receive a print of the photo on Photo Day, Saturday, July 14, before the 3:55 Cardinals game which is another FOX telecast. The Phillies now have J. D., J. C. and J. A. on the pitching staff (Durbin, Romero, Happ). The AL and NL teams will be unveiled tomorrow on the MLB All-Star Game Selection Show Presented by Chevrolet on TBS TV at approximately 4 p.m. (EDT), or immediately after that day’s 1 p.m. Braves/Marlins game. Each All-Star squad will have eight selected starters, as determined by the fan balloting program, and 23 pitchers and reserves, as determined by a "Player Ballot" and the two All-Star managers, Jim Leyland and Tony La Russa, in conjunction with MLB. Immediately following the announcement of the rosters, fans will have the opportunity at MLB.com to select the final position player for each league’s 32-man roster. The Monster 2007 All-Star Final Vote will provide fans the opportunity to cast their votes from a list of five players from each league over a four-day period. June 29, 2007, 5:42 p.m.
Rollins, ss; Bourn, rf; Utley, 2b; Howard, 1b; Rowand, cf; Burrell, lf; Nunez, 3b; Ruiz, c; Hamels, p.
Fans were great in exiting Citizens Bank Park so the 300-person cleaning crew could begin getting the placed clean so the gates can open at 6:05 p.m. for the 7:05 game. Ten minutes after the game had ended, crews were in the lower and upper levels working their way up from field level picking up cups, hot dog/hoagie wrappers, pieces of funnel cake, sticky globs of cotton candy, rejected soft pretzels, etc. Following the game, the Phillies designated RH reliever Clay Condrey for assignment to make room for LH reliever J. C. Romero. Charlie Manuel now has two lefties in the pen. Rollins, ss; Bourn, rf; Utley, 2b; Howard, 1b; Rowand, cf; Dobbs, lf; Helms, 3b; Barajas, c; Durbin, p.
Jimmy Rollins’ game-winning single obviously was big last night. The only more dramatic finish would have been a walk-off home run which would have given him the cycle. His triple was his 10th. He’s now had double figures in doubles, triples, homers and stolen bases five times. He and Juan Samuel were tied for the most in Phillies history until last night. Getting a green light on a 3-0 pitch many times results in an out because the hitter is over anxious. Greg Luzinski was a good 3-0 hitter, Mike Schmidt the opposite. Chase and Jimmy are certainly in that class. Following the 1:35 afternoon game today, game two of the four-game series will begin at 7:05 tonight. Gates won’t open until 6:05 p.m. to allow the cleaning crew to do a quick but thorough job. Somewhere around 300 people will be busy readying the park for the night game. The cleaners are unsung heroes. Another Independence Blue Cross fireworks show is on tap post-game. What will the players do between games? Rest, check their voice mail messages, grab a bit to eat, shower, change uniforms, hit in the indoor batting cages or work out in the weight room. Some of the hitters will spend time in the vide room watching tapes of RHP John Maine. Tonight’s game as well as 3:55 tomorrow afternoon and Sunday’s game are sold out. That will make 18 sellouts for the season. Because their Thursday night game was rained out before it started, the Mets got to Philadelphia around 11:30 last night. They crawled into their Philadelphia beds before the Phillies. Because the late night last night, Phillies players were told to be dressed by 12 noon today. During the third inning of this afternoon’s game, Mets TV announcer Keith Hernandez will join the Phillies broadcast team and Garry Matthews will move over to the NY crew. In the second game, Chris Wheeler and Ron Darling will switch for one inning. Phillies will be on FOX TV tomorrow afternoon (Kenny Albert and Tim McCarver). Another Tim, as in Tim McGraw, will throw out the first ball. FOX will also televise the 3:55 Saturday, July 14, Phillies-Cardinals game. The next day, a Sunday Night ESPN telecast with a special 6:00 p.m. start. Rollins, ss; Victorino, rf; Utley, 2b; Howard, 1b; Rowand, cf; Dobbs, lf; Helms, 3b; Ruiz, p; Eaton, p.
It was another tough loss last night because the Phillies had the lead and couldn’t hold on. Bullpen issues are more than just a Phillies concern. Looking around baseball yesterday: 14 games were played, 80 relievers were used, combined they threw 99 innings, allowed 47 runs, lost four games, won three and recorded seven saves. The numbers could have been a little higher because one of the 14 games yesterday (Cardinals/Mets) was called after five and one-half innings. Each team used only pitcher. Ryan Howard’s historic homer was a monster smash that landed in Memory Lane which is located behind the 31-foot high brick batter’s eye wall in center field. After the ball landed in Memory Lane, it bounced over a Turkey Hill ice cream stand in Ashburn Alley. Ryan became the first player to hit one over that wall a year ago, an estimated 496 feet. Last night’s was an estimated 505 feet. Distances are estimated off charts of various sections of Citizens Bank Park. It is not an exact science. The blast was historic because it was Ryan’s 100th career home run. He got to that number faster than anyone in major league baseball, according to the Elias Sports Bureau. It came in his 325th game. Ralph Kiner held the old mark at 385 games in 1948. Paul Hagen of the Daily News talked to the fan that got the ball, Joe Ruffin of Summit, NJ. Ruffin agreed to return the souvenir for a Howard autographed baseball. “If Howard wants the ball, he should have it,” Ruffin was quoted in Hagen’s story. A fan who is lucky enough to catch or retrieve a home run hit by a Phillies player can turn the baseball into Guest Services during that game and the Phillies will have the player autograph the baseball, compliments of PECO. Once autographed, the Phillies return the ball to the fan. After tonight, the Mets come in for four games in three days. It all starts with a day/night, separate admission doubleheader tomorrow, 1:35 p.m. and 7:05 p.m. Fans will exit the park and parking lots after the 1:35 game. Cleaning crews and ARAMARK’s staff then take over, getting the park ready for the night game. Gates will open at 6:05 for the 7:05 p.m. game which is followed by an Independence Blue Cross fireworks show. For those of you coming to games tomorrow, carpooling or public transportation is recommended. Variable electronic signage will be located throughout the Sports Complex directing fans to the parking lots. For those of you watching on TV or you computer or listening on the radio, fill your tummy, brush your teeth, take a snooze and get ready for the night gamer game. If the Phillies lose the first game, shake off your emotional downer by taking a short, brisk walk. If the Phillies win the first game, hug someone. With J. D. Durbin pitching the first game tomorrow, the Phillies will need to make a roster move. Then, J. A. Happ is scheduled for Saturday’s game, which means another roster move. Stay tuned. Online balloting ends at 11:59 tonight: www.mlb.com/mlb/events/all_star/y2007/ballot_reg.jsp. If you try to vote after midnight, rumor is you may turn into a pumpkin. Rollins, ss; Bourn, lf; Utley, 2b; Howard, 1b; Rowand, cf; Victorino, rf; Nunez, 3b; Ruiz, c; Moyer, p.
Notice Abraham Nunez is at third base. With Moyer change-of-speed pitching, right-handed hitters will pull the ball more often. Charlie Manual wants Nunez in their because of his excellent defensive skills. He’s made two terrific plays this week. Jamie Moyer’s last start against the Cincinnati Reds came a long time ago—May 14, 1991 which is 16 years and 44 days. That is the third longest gap for a pitcher between starts against one team in Major League history. The record is 18 years and 24 days held by Red Ruffing against the New York Yankees (1929-47). Michael Bourn is 11-for-11 in the stolen base department. He leads all NL rookies . . . Last night’s victory was the Phillies’ 22nd come-from-behind variety, tops in the NL . . . Phillies are hitting .278 as a team at Citizens Bank Park . . . Chase Utley, Michael Bourn, Carlos Ruiz and Aaron Roward are all over .300 at home. Last time a Ruiz stole home in a Phillies game was 1964. For all you youngsters out there who aren’t aware, Chico Ruiz stole home in the sixth inning with Frank Robinson at bat. The Reds won, 1-0. 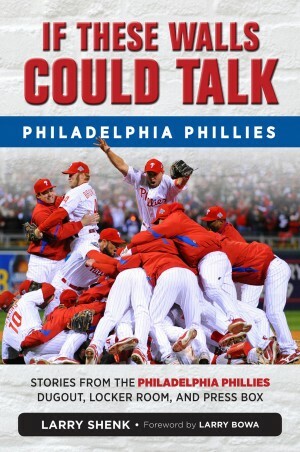 It became significant as that loss started a fatal 10-game losing streak that cost the Phillies the pennant. Last night, Carlos Ruiz stole home as part of a double steal. Perhaps it is a sign of good things to come. How many other Phillies catchers have stolen home? That question was posed to a Skip (Memory Lane) Clayton, a Phillies history buff. His response: Bo Dias, June 28, 1982 and Stan Lopata, June 11, 1956. Records beyond the 1950s? “Skimpy,” responded Skip. Online balloting ends at midnight tomorrow: www.mlb.com/mlb/events/all_star/y2007/ballot_reg.jsp. Rollins, ss; Bourn, lf; Utley, 2b; Howard, 1b; Rowand, cf; Victorino, rf; Dobbs, 3b; Ruiz, c; Kendrick, p.
A new promotion at Citizens Bank Park tonight, held in conjunction with the National NeedleArts Association. Fans are invited to knit, crochet, embroider, cross-stitch and needlepoint while enjoying the game. Over 1,300 needle arts enthusiasts will be here. A teaching table will be set up where fans can learn needle arts. Project Linus will also be on hand. That organization provides seriously ill and traumatized children with handmade blankets. A quilt is being donated by Project Linus to Camp Erin, the charity of Jamie and Karen Moyer. All of this will take place in Section 211. To date, the Phillies have used 21 different pitchers, which falls six shy of the club record set in 2000. The club record for the fewest pitchers in a season is 11, set in 1976. That is not a misprint! ELEVEN! From opening day until the rosters expanded on September 1, the Phillies used only 10 pitchers: Steve Carlton, Jim Kaat, Jim Lonborg, Larry Christenson, Tommy Underwood, Ron Reed, Wayne Twitchell, Ron Schueler, Gene Garber and Tug McGraw. The 11th pitcher was Randy Lersch, who pitched once on September 27. The major league record for fewest pitches in a season is five, as in FIVE: NL—Boston (1901) and AL—Boston (1904). This week alone, the Phillies will be using six different starting pitchers. Online balloting ends at midnight this Thursday: www.mlb.com/mlb/events/all_star/y2007/ballot_reg.jsp. First, Barry Bonds came parading in with his 746 home runs. He was followed the next week by Jim Thome and his 480 homers. Now. Ken Griffey Jr. brings his 584 total to town for three games starting tomorrow night. That’s the start and end of June at Citizens Bank Park. Well, the end really is this weekend when the New York Mets come to town for the second time this year. Griffey has been hot this month. He hit a pair yesterday to conclude an emotional weekend in Seattle, his first there since being traded by the Mariners in 1999. He’s now two behind Frank Robinson for sixth place (586) on the all-time list. Last week, Sammy Sosa became the fifth player to reach 600 home runs and Griffey will be the next, but not the next three days. Since he spent most of his career in Seattle and then in the NL Central Division, Griffey hasn’t faced the Phillies that much. When the two teams met in a three-game series in Great American Ball Park this April, he was ill. He did pinch-hit in the third game and drove in a run. For his career, he has three homers off the Phillies, the fewest against any team (other than Seattle). Two of the homers, however, have come at Citizens Bank Park, both coming in 2005. On Wednesday, the 10 millionth fan will come through the gates since Citizens Bank Park opened in 2004. The symbolic 10,000,000th fan will be honored pre-game on the field and receive a trip to Clearwater, FL, via Southwest Airlines, front row seats on Wednesday, a dozen roses and a partial season ticket plan for 2008. Tickets are available for tomorrow and Wednesday night and the 1:35 afternoon game (Mets) on Friday. All other dates on this homestand are sold out. A limited number of standing room tickets will be sold the day of each sell out. Because of the fireworks setup, the ticket windows on the North side of Citizens Bank Park (Phillies Drive) will be closed from tomorrow through Friday. Tickets are on sale 24/7 on phillies.com and fans can print their tickets at home. For those fans who have ordered tickets via a credit card, two ticket kiosks are set up outside the First Base Gate. Fans can use the credit card to print tickets, a new convenience. Online All-Star balloting ends at midnight this Thursday: www.mlb.com/mlb/events/all_star/y2007/ballot_reg.jsp. The long marathon journey to October baseball has gotten a little more treacherous for the Phillies. Not good news on veteran starter Jon Lieber. He now joins Brett Myers, Tom Gordon, Freddy Garcia and Francisco Rosario on the disabled list. As you’ve read in all the news reports, Lieber’s stay may be a lengthy one. Pitching is such a rare commodity. It is razor thin. According to Dave W. Smith of retrosheet.org, Jamie Moyer was one of six pitchers over 40 years of age to start on Friday. That has not happened in the last 51 seasons. Yesterday in major league baseball, there were 14 games played. Complete games? Try zero! A total of 76 relievers were used. The Phillies have used 14 pitchers in the pen this season. Only two were on the active roster when the season started on April 3, Antonio Alfonseca and Geoff Geary. The rotation now exists of Moyer, RHP Adam Eaton, LHP Cole Hamels and rookie Kyle Kendrick. Only Hamels was with the club a year ago at this time. Kendrick was at Reading when this month started. There’s a day off tomorrow and again on July 5, but in the meantime there are 10 games in nine days starting Tuesday, including a day-night doubleheader with the Mets on Friday. What will the Phillies do? Trading for pitching is difficult simply because the demand exceeds the supply. Plus, any team that now may have pitching to deal knows the Phillies’ situation so the price goes up. Waiver claims are a potential, but slim. Signing a pitcher who was released is another avenue to travel. Lefty reliever J. C. Romero, signed Friday by the Phillies after being let go by the Red Sox, is someone worth taking a chance, as was Jose Mesa. Romero is currently with the Gulf Coast League club in Clearwater getting in some work. Homegrown is another option. Over the next few days, the Phillies will be checking with their minor league staff so see what options exist. It appears as if the Phillies are going to be busy in the transactions department this week. Jamie Moyer had as good an all-around game last night in St. louis as you will ever see form a pitcher, let alone a 44-year-old. He played the game as if he was in Souderton High School. He always plays it that way. **He won his seventh game (six scoreless innings) and all seven have come after a Phillies loss. Since he came east last August from Seattle, the Phillies are 9-2 when he starts after a defeat. **He singled to start a five-run inning and scored from second on a Shane Victorino hit. **He scored with an old-fashioned feet-first slide at home plate. He bounced up, grabbed Victorino’s bat that was lying there and sprinted to the dugout. **He took a hard grounder by Albert Pujols off his left knee, scrambled after the ball, flipped it to Ryan Howard as he took a bellyflop on the grass. It was the last out and guess what, he sprinted to the third base dugout again. **He laid down a sacrifice bunt that led to another run. **He didn’t drive the bus back to the hotel simply because there was no bus. The hotel is two blocks away. He probably sprinted. “He (Jamie) runs harder back to the dugout than a lot of guys do to first base,” Charlie Manuel. “When I hit the ground (run-scoring slide), I was surprised. I felt like I was on marbles. And it wasn’t because of any speed,” Moyer. “I gave it (the slide) a 9.5 because he didn’t have a lot speed behind it,” Greg Dobbs. Tough loss last night, especially after the Phillies regained the lead against C. C. Sabathia, one of the top pitchers in the game. The Phillies finished 2-4 against the two best teams (Detroit/Cleveland) in the AL Central. They are the two best offensive clubs in that league and that’s why they are dueling for the division title. The Phillies could have easily been 4-2. Bullpen inconsistency led to two of the four losses. There is a silver lining in last night’s game, two hitless, scoreless innings by Geoff Geary. He’s struggled lately which any pitcher or hitter can do. Geary is a very important part of the bullpen. So, it is good-bye to the AL and back to the NL starting tomorrow night in St. Louis. The Phillies need to regroup and avoid the other trip to Missouri a couple of weekends ago. In case you forgot, the Phillies lost two of three to the Royals. The Cardinals are really scuffling, partially because of numerous injuries. But, they are still the defending World Champions. Last night’s defeat registered 9,990 in the history of the Phillies. Ten more creates a milestone that has never been reached by any other sports franchise. Get ready for some dandy media coverage, including two biggies, Sports Illustrated and USA TODAY. Established in 1883, the Phillies are the oldest, continuous, one-name, one-city franchise in American professional sports (although the team briefly used alternate nicknames in some years). Of the eight teams in the National League in 1883, only three other franchises have been in the league as long as the Phillies, Chicago, New York (San Francisco) and Boston (Milwaukee-Atlanta). Before you ask, no, I wasn’t around in 1883! 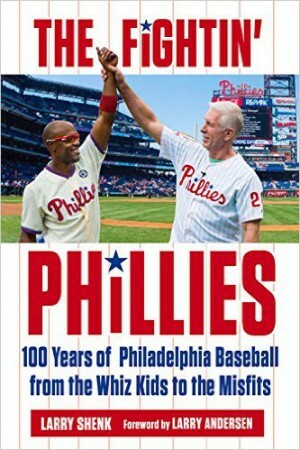 Because of the Phillies longevity, they have played more games, won more games, lost more games and attracted more fans (over 115 million) than any other sports franchise in this city. No team will catch us. The Phillies been a Philadelphia institution longer than Philadelphia University, Temple University, Ballard Spahr Andrews & Ingersoll, Philadelphia Suburban Water Co., Sunoco, Inc., The Racquet Club of Philadelphia and Goldenberg Candy Co.
Carlos Carrasco, the 20-year-old right-handed pitching prospect, has been promoted from Clearwater to double-A Reading. His Clearwater numbers for 12 starts: 6-2, 2.84 ERA, 69.2 innings, 49 hits, 22 walks, 53 strikeouts; opponents batted .199. His two June starts: 1-0, 1 run in 17 innings with 15 strikeouts. A year ago he was the Paul Owens Award winner as the best pitcher in the Phillies minor league system. He’s headed for a repeat. He’s making his AA debut tonight at Reading. Carrasco and Lakewood 2B Adrian Cardenas have been selected to the July 8 XM Satellite Radio All-Star Futures Game in San Francisco. Carrasco will be on the World Rostes; Carednas, the USA Roster.